Today, pro bowl QB Jay Cutler is making his return from a groin injury vs. the 4-9 Cleveland Browns. This is exciting for many because the 22,224-career yards quarterback will once again combine his talents with the top receiving duo of Brandon Marshall (1090 yards) & Alshon Jeffery (1,193 yards). While it may be exciting for a lot of Windy City sport fans, it's not for a good amount of them. Josh McCown will be benched and the move is not sitting well for some. The latest NFC offensive player of the week has been playing at an all-star level while Cutler has been out. 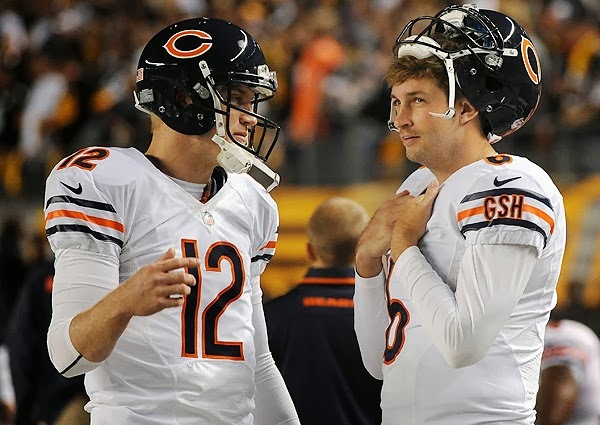 In a 45-28 Chicago Bear win over the Dallas Cowboys, McCown scored 5 touchdowns, 4 were with his arm and 1 was with his feet. He became the first Chi-Town Bear to account for five touchdowns in a game since Jack Concannon in 1972. In a stellar seven game run, McCown has thrown for 13 TDs and only one interception. His passer rating of 109.8 is only behind Nick Foles (120.0) of the Philadelphia Eagles and Peyton Manning (114.5) of the Denver Broncos. There are analysts who disagree with head coach Marc Trestman's move to replace the history making Josh McCown but at the same time some will agree with the move. Jay Cutler is a bona fide pro-bowler who has recorded over 3,000 yards five times. Cutler has even taken the Chicago Bears to a NFC Championship (2011), a game that they hadn't seen since 2006. Plus, Josh McCown continues to say he knows his role as a backup quarterback. McCown is a Sam Houston State representative that hasn't put anything close to an all-star year. Talk about the two QB's careers never happens. It should be recognized that the 30-year old Jay Cutler is a better QB than the 34-year old McCown statistically overall. Many thoughts continue to arise. Maybe McCown's career year is not a fluke as some would imply. Maybe this guy could keep his record breaking swagger up. Maybe he doesn't continue his recent success. If Trestman keeps Cutler out of games for McCown and the backup ball slinger messes up the rest of the way, some will be sure to criticize. Jay Cutler has been known as a better quarterback than most, including Josh McCown for years. So should the Bears pull the plug on him because of a nice seven game McCown run? According to Trestman, the answer is no. Cutler is the Bears starting quarterback and Trestman is sticking with him. Jay Cutler will take the field vs. the Cleveland Browns at 1:00 PM EST today (12/15/2013). He is expected to continue playing the rest of the season with the desire to bring the Chicago Bears a 2013 NFC North crown. The Chicago Bears currently have the same record as their NFC North opponent and current first place team Detroit Lions. The Calvin Johnson-Lions hold the tie breaker. Cutler's Bears need to win games if they want to secure that first place spot. Cutler is a free agent at the end of the season.